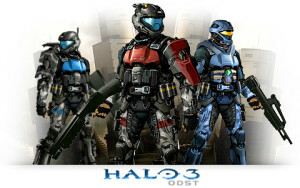 Halo 3: ODST (Orbital Drop Shock Troopers) is the coming addition to the Halo series for the Xbox 360, and is set during the Halo 2 timeline within the city of New Mombasa. You will first be playing as an ODST known as “the Rookie”, trying to locate your five squadmates who are scattered throughout the city. Any fans of the show Firefly may be interested to know that Nathan Fillion, Adam Baldwin, and Alan Tudyk all lend their voices as ODSTs. The game will feature an open world environment where the player is free to explore the city while trying to find his squadmate’s beacons. This is a noteworthy change of pace from the very linear gameplay the Halo series has had thus-far. That being said, there will be “flashbacks” during which the player switches to one of the other squad members and is funneled through areas with foes aplenty and guns ablaze. Since you’re not playing as a genetically enhanced several ton cyborg supersoldier, you will no longer have a rechargeable energy shield, or radar for spotting enemies. But Bungie is looking out for us, and has added a new feature to the heads up display: The VISR(Visual Intelligence System, Reconnaissance); Turn on VISR, and all enemies will be outlined in red, all friendlies will be outlined in green, and important items will be outlined in yellow. This will come in handy, as it can highlight enemies that might not otherwise be visible in the game’s darker environments. Oh, and the HUD’s got a nifty compass now, as well. Okay, don’t freak out, but those crazy cats at Bungie went and took out duel wielding for the campaign mode. Another result of being a mere human, I suppose. But there is some good news: Halo junkies will be glad to know that the original Halo magnum is back, in all it’s zoomy, headshotty goodness; though a sound suppressor has now been added on for extra sneakiness. Also, the smg has been upgraded with tighter shooting, an increased zoom level, increased damage, and a silencer. Covenant carnage has never been so quiet. Face Certain Death With Friends! One feature that has a lot of the Halo 3 crowd buzzing is Firefight mode, in which up to four players play on one console or join through system link to face off against Covenant forces that increase in both number and difficulty after each wave. The first wave may see you facing off against grunts, but eventually you will be pitted against a group of Brute Chieftains. And the rounds in between are made up of randomly selected opponents, so trying to plan your way through may prove impossible. Oh, and I should mention that skulls are activated at random as well, making for an even more insanely intense fight. See how long you and your friends can survive! Maps for this gametype are unlocked as you progress through the campaign mode and total ten in all. The Future of Gaming or Something. Overall, this game looks like an interesting addition to the Halo collection, with some changes to gameplay that could freshen up a series that’s becoming stale to some. And I almost forgot to mention, as an added bonus every copy of the game will come with an invitation to join in the Halo: Reach multiplayer beta, about which Bungie has been quite hush-hush.